Investments in high-voltage transmission facilities require large financial commitments and significantly affect the future reliability and economy of the interconnected power system. Transmission expansion planning is complicated by the potential component unavailability due to forced or scheduled outage. Transformers comprise one important set of system components of which many in current use are reaching an advanced service age. Condition monitoring technologies can help improve predictions of their reliability. We formulate and analyze an optimization model for transmission expansion planning and transformer replacement that accounts for transformer as well as transmission line reliability and solve a small instance in a reasonable amount of time. 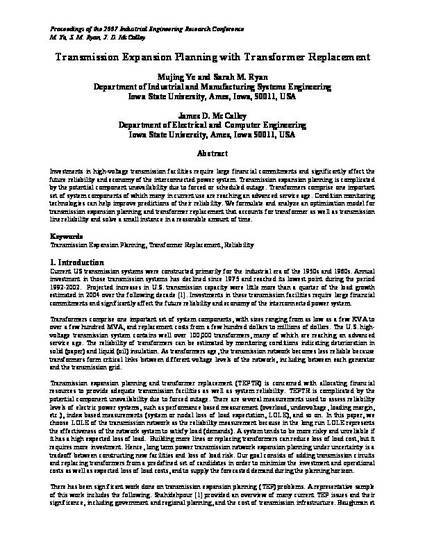 This proceeding is published as Ye, Mujing, Sarah M. Ryan, and James D. McCalley. "Transmission Expansion Planning with Transformer Replacement." In Proceedings of the 2007 IIE Annual Conference and Expo. May 19-23, 2007, Nashville, Tennessee. Posted with permission.